Indomie is synonymous with noodles in Nigeria, although it is just one brand out of many other delicious noodles. So, a request to “go and buy indomie” then may be followed by “which one?” and then another response “normal Indomie” “Chikki or Mimee” and some other answers you can help me identify😀. The Noodle market would definitely have increased by now, I can still remember Mimee noodles and their ‘bomshashaa’ advert…hope it is still in the market. Noodle is a favourite with kids and making it into balls is another way to enjoy it as a handy food, also perfect for the lunchbox. Noodle balls are more of an Asian recipe, which they normally add chicken to before baking or frying. They are also eaten with a side sauce, preferably sweet & sour sauce. 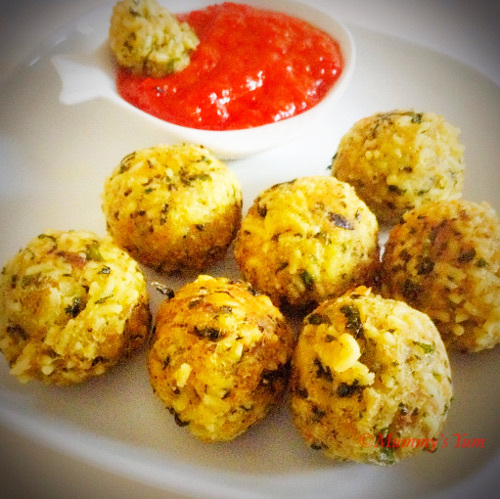 I used mackerel fish (‘Azu fridge’ as it is known in Igbo) and the ugu leaves to make these balls more Nigerian. The honeyed pepper sauce is an alternative to ketchup and was made with the long tatashe, so it is not hot at all. I had some already blended pepper puree, so it was more of an experimental sauce and i could tell it was enjoyed. The fish and ugu leaves add to the nutrition, and the sauce is completely healthy and sweet for the kids. Honey (for one year and above) has many health benefits which includes sustained energy, wound healing and also it helps to control cough in kids. Why don’t you add these balls to your kids menu list and I am sure they will thank you for it. 1 cooking spoon of tatashe puree – This is made with deseeded long tatashe pepper variety, blended with onions and ginger, then boiled till the water dries up. Put the noodle in a bowl and pour boiling water to soften it. Leave for about 10 minutes in the water before draining. Put back in a dry bowl, add the fish, breadcrumbs and ugu leaves. Using your hands, mix everything together and then roll into balls. Heat oil in a pan and fry the balls until they are golden brown. You can fry for longer if you want it a bit burnt. Put oil in a small pot and add the blended tatashe purée to fry for about a minute or two. Add honey, stir and remove from heat. Don’t forget to leave a comment, hit the share button and also follow Mummy’s Yum on Facebook, Twitter and Instagram for more tips and ideas.Ugu, fish plus honeyed pepper sauce… all for noodles and still perfectly healthy. Thank you Celestina. It sure is and please try it and give a feedback. This is absolutely refreshing. Am already salivating to say the least. Lucky, it is quite easy to make. Try it.